I believe these sequences are before / after AFM scans. 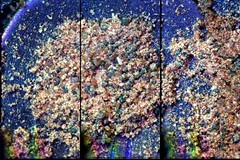 Notice the broken particle. I hope in fact the target was the longish curved rod just below it. For the source of the sample delivery you need to correlate to Mark Lemon's log. It doesn't say all that much but it gives a guide as to where the arm is digging on the sample delivery days. Bit harder to correlate the later deliveries until they update the matrix. But they are trying to get as much sampling and science done as possible while they manage the deteriorating systems onboard and watch the periods of darkness lengthen day by day. So while I might wish for more information, I also appreciate where the priorities lay. The other font of information is Emily Lakdawalla's blog on www.PlanetarySociety.org. Personnaly I thing the Phoenix team have been absolutely outstanding and I stand a little in awe of their design and engineering capabilities. I find it disheartening in that I do not think I have seen a single thumbs up or 'well done guys' on this forum, whereas there are brickbats and insults aplenty. BRAVO MECA OM guys! A work of ART! You have to look at the original size for the full impact. I didn't try to join the individual EDF images. An dPhoenix team, thanks again and again for for the wonderful opportunity to peek over the shoulders of scientists working against the clock. I think you might even work as hard as I do playing. But I am sure it is the adventure of your life and the defining moment of your careers. Ahh Hort, I will sleep well tonight. some changes occurred in version updates for the very good imaging software, but my memory fails me for that right now, and I believe the current versions will work well. Large files occasionally collapse the editor, as I use tens to hundreds of MB for many images in transition. I'm disappointed the industry spends so much effort on non-interface transitions and jumping, as the various free software items available could form a very powerful image file analysis tool in combination. Spam email damages used to amount to ~fifty a day+, but have slowed to a few. I can be contacted at; danajohnson 0 at yahoo dot com(reassemble to write); if you, or any others, want to talk about software without noising the topic here. I am studying some nice graphics editors, but so many are short-term evaluation use only, or 'no save' type end products. Rather than sound complaintful publically, it is probably better to be critical in private, and release a few links for the best selections here for all to use. Some great items are hiding out there for the inquisitive types of readers. These new up to date Phoenix images are great looking stuff, with good software techniques of viewing shown here. So much variety, with so few simple crystals seen, as we could see on the Mars equatorial MER zone of imaging. In particular, I've been watching for more apatite/calcite combinations, or , just the apatite crystals. On Earth, it's often a new story every square meter. This week I magnetized a steel knife blade, by repeatedly drawing it across other steel for many hours. A subject for all ages, filling images with the unseen forces that permeate our surroundings. Organizational activity allows the forces to be seen as though the camera were the 'microscope', magnifying the effects thousands of times beyond the simple value of the force as we can measure it, with magnetism often being accumulative. When will we be able to see these smaller actions up close in visible terms? This OM is giving a great field of view. According to this article, "waterbears" can survive the vacuum and radiation of space. 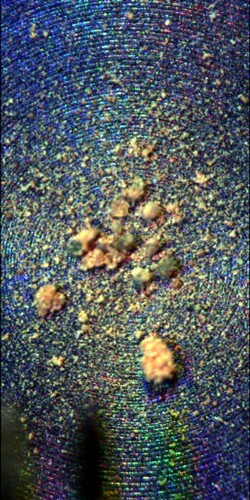 They are multicellular, about 1 mm in size. Something to look out for on Mars? Here is the link to spaceref.com/news/viewpr.html?pid=26387">Unique animal species can survive in space. One of these days the brain dead comments parser used by this site will be rewritten so it recognizes all valid links. This is what a dehydrated "water bear" looks like. Yeah...water bears...saw them and other things like water-fleas and amoeba in drops of rain water I gathered after a gushing rain storm while collecting samples in the road curb at 10 years old. I can understand their usefulness in wanting to live somewhere in the universe. Yes, that feature in the OM does look remarkably like a dehydrated tardigrade (water bear). Tardigrades are aquatic creatures. It is interesting that as recently as 10 to 20 million years ago, the polar regions of Mars may have had liquid water due to higher obliquity. Interesting post in the "Blue" blog. The Phoenix site seems to be down, perhaps caused by a wave of interest prompted by this post. I would have to say no. This seems to be part of a "before sampling" sequence of OM39 ( strong magnet ). Quite a few "befores" were done on sol 105. I didn't do a complete check to see if all the remaining unused cells were imaged - but it wouldn't surprise me. 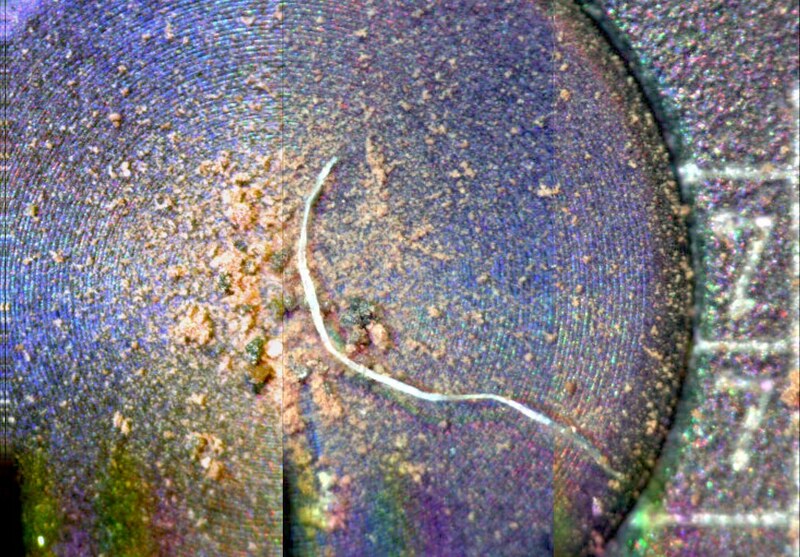 It looks like a wire stuck to the magnet - most likely Earth contamination. I am still shocked - shocked I tell you - shocked - how much contamination there was in the sample cells. But when I think about what the entire spacescraft has endured to get where it is now - then it is not much of a shock. I am now thinking more like 3.5 months ago as an earth contaminant. I was very surprised that very little notice of it when it first came out (in the first coloured OM composite) and my hopes were up that it possibly presaged finding lots of unequivocally bio type stuff in the OMs and AFMs. However, we still await those AFMs. What, however, are the chances against a dehydrated tardigrade making it to Mars outside the lander and then being deposited with martian dust on the sirst substrate exposed? Surely less than that 911 terrorist's passport being found intact in New York having survived the crash and the enormous fires? Wonder how the AFM work is coming on? I saw the wire last night and thought it was most likely an earth wire also. Er, maybe I spoke too soon. 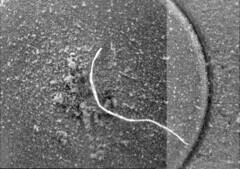 There does seem to be a fair amount of soil in the cell - and the "wire thingie" is laying on top of the soil. Now, it is still most likely Earth contaminant, but how it got into the cell is another matter. It seems to have happened after the soil was added. 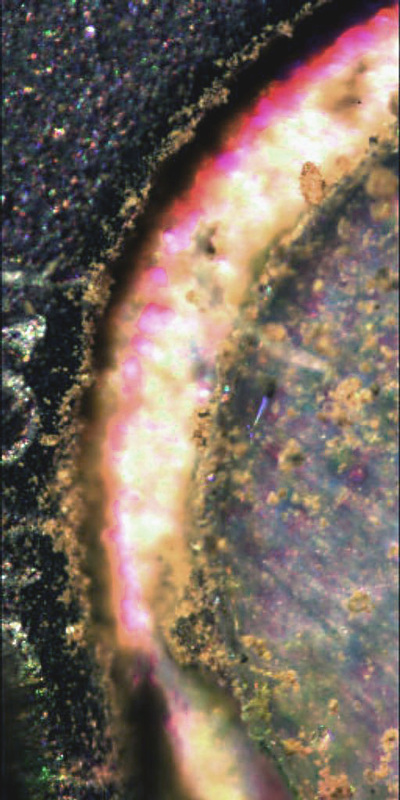 A closer look seems to show that in fact it is a ribbon - not a wire - about 40 microns thick and 15 microns wide and 1.7 mm long. That probably narrows down the possibilities, right? Oh yes, and it fluoresces. A series of links to some very good software used in the AFM visualization processes similar to the single image displayed for the Phoenix AFM. I used the software for the presumed cantilever tip image in a prior post, and these new particles are begging for some study in just such a package. I'll work on these items you were kind enough to show, and recommend to all of you that you read and consider the download of the software while we are seeing such intriguing new results from Phoenix. The software worked well for me, but there are limitations, and not all will want to try it. My examples on the linked topic here, were so small as files sizes, you'll have to mouse-click the text place-holder box to see the real 3D examples I produced. The next few months will be filled with examples from various sources, with such challenging items to see. Some gallery links on the topic as well, then return here for the OM daily news-wire. Er, winston, I think this is the first image in this particular sample of the "wire thingie". Could you provide a sol on which another "wire thingie" was imaged? The nematode C. Elegans, a small soil dwelling worm about 1 mm in length. Still not a clue. 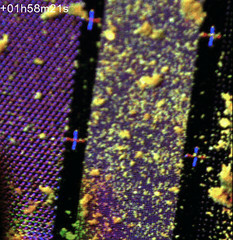 Maybe part of the AFM broke and fell onto the sample wheel? Er, where are the AFM scans?